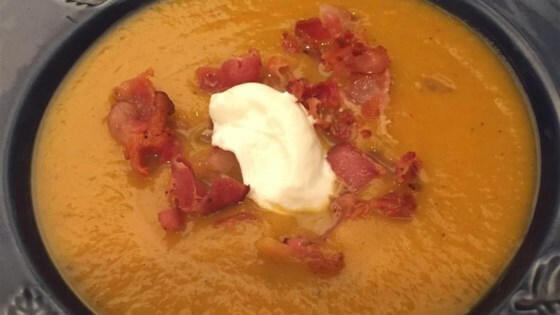 "I created this soup on Christmas Eve and it was a huge hit. The roasted squash caramelizes giving the soup that extra depth of flavor. This soup has a very creamy consistency but is completely dairy-free except for the optional garnish of sour cream (I did this on purpose due to a guest who is allergic to dairy). It is also extremely healthy. Don't shy away from the curry powder; it gives the soup that extra flavor. Feel free to play around with the amount of carrot, onion or celery, garlic to your taste. This soup can be made the day before and reheated." Preheat an oven to 375 degrees F (190 degrees C). Place squash in a large bowl and drizzle with olive oil; mix to coat; sprinkle with salt and pepper. Spread squash into a single layer on a baking pan. Roast the squash in the preheated oven, turning once, until fork-tender and caramelized; 30 to 40 minutes. Place the bacon in a Dutch oven and cook over medium-high heat, turning occasionally, until evenly browned, about 10 minutes. Remove the bacon slices to a paper towel-lined plate, reserving the drippings in the pan. Place the onion, celery, carrot, bay leaf, curry powder, thyme, and salt and pepper in the Dutch oven; cook in reserved bacon drippings until the carrots and celery are soft. Mix in the apples and cooked squash and cook another 5 minutes. Stir the garlic into the mixture and cook another 1 minute. Pour the apple cider over the mixture; reduce heat to medium-low and bring to a simmer; allow to reduce to about half its original volume. Stir in the chicken stock; simmer over medium-low heat for about 20 minutes. Puree the soup in small batches in a blender, or use an immersion blender. If using a blender, don't fill the blender more than half-way. Always remove the center lid piece of a stand blender when blending hot liquids so the steam can escape. Cover the hole with a dish towel while blending. Stir the nutmeg into the soup. Garnish each bowl with 1 tablespoon of sour cream and some of the bacon pieces to serve. I made exactly as the recipe stated. Way too vinegary for my family. Other than that I think it has the potential to be a good soup. If I ever made again I would considerably cut the vinegar.